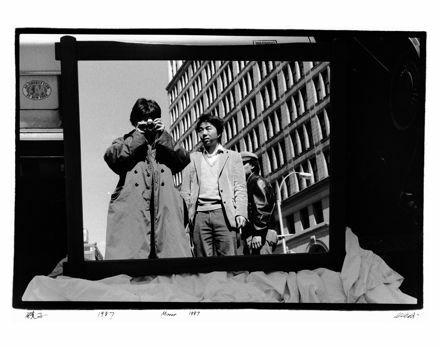 Ai Weiwei, Washington Square Park Protest (1988), all photos courtesy of Three Shadows Photography Art Centre and Chambers Fine Art, via Asia Society. Art Observed was on site at the Asia Society’s Ai Weiwei retrospective, which comprises over 200 photographs taken by the artist in some of his most pivotal years. 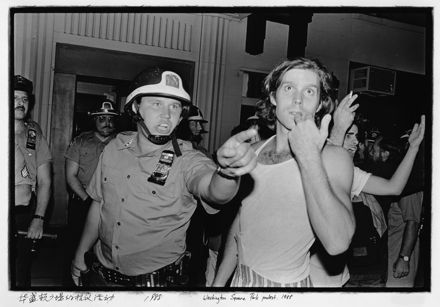 Between 1983 and 1993, Weiwei documented protests of system, political, gender, and artistic. 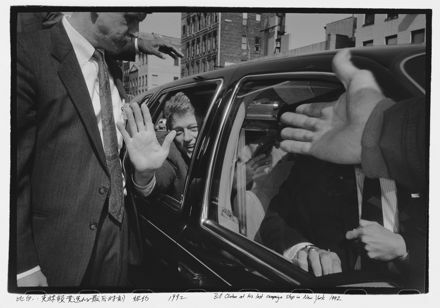 The show is a collection of black and white photographs, numbered simply and elegantly. The titles are Weiwei’s own, scrawled at the bottom of each piece. 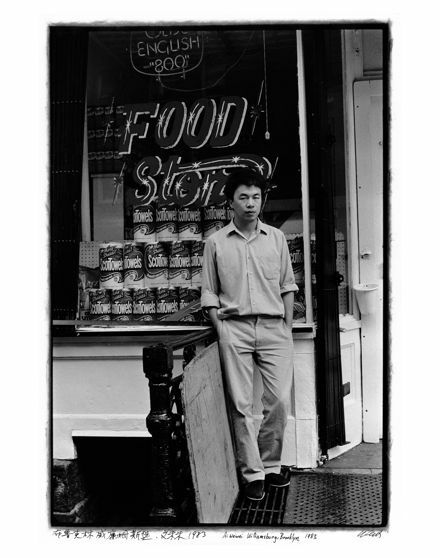 A visitor follows Weiwei through his life in the East Village. “New York Photographs” chronicles Weiwei’s interest in transformations, as they manifest through the artist’s perspective, and closes August 14. Weiwei captures the ordinary — protests, actors, friends, the self — and renders it extraordinary. His photography hearkens back to the ready-mades of Duchamp, whom Weiwei explicitly references (and re-captures in kind). “Profile of Duchamp” (1983), for example, is a photograph of a coat hanger, half of which is filled with sunflower seeds, in the shape of a man’s face. Then there is “In Front of Duchamp’s Work” (1987), taken at the Museum of Modern Art, which is a self-portrait of Weiwei through “The Bride Stripped Bare By Her Bachelors, Even,” itself obsessed with the act of capturing. This piece appears in the midst of photographs following actors and transvestites through their transformations. The exhibition is in chronological order; Weiwei has made of his work a history (or, as he may be saying, his work — art or remembering in general — make histories). Born in 1957 in Beijing, Ai Weiwei lived in New York from 1981 to 1993. Following an international furor, Ai WeiWei was just released after a three-month imprisonment in his home country. The artist has recently exhibited globally in such venues as at the Fotomuseum Winterthur, Switzerland; Lisson Gallery in London, the Neugerriemschneider in Berlin, the Ludwig Museum, Germany, the Tate Modern, and an outdoor sculpture installation “Zodiac Heads” in New York and correspondingly at the Somerset House, London. 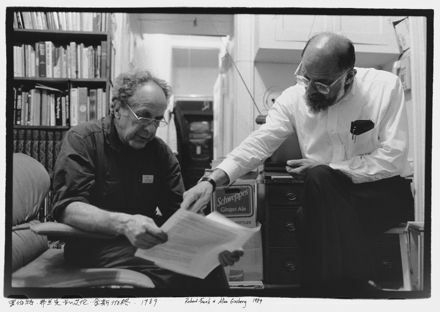 “New York Photographs” is enabled by Asia: Ideas and Images, and endowed by the Mattawin Company and Harold and Ruth Newman. During its first week in Lexington, Groupon’s featured deals included an art museum membership and a coffee shop. Upcoming deals include yoga classes, wine tasting and deli fare. Lexington joins Louisville as Kentucky’s second Groupon market, the Company said. This entry was posted on Friday, July 29th, 2011 at 9:24 am	and is filed under AO On Site, Go See. You can follow any responses to this entry through the RSS 2.0 feed. You can leave a response, or trackback from your own site.